1. 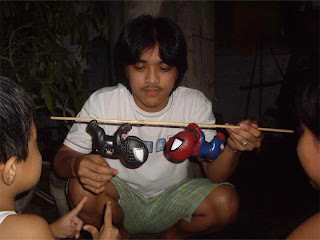 The sport of spider fighting exists in several areas of the world among those of course is the Philippines. Unlike in other Asian countries, in the Philippines the said sport is just common and nothing extra-ordinary. What makes its difference is when some Filipinos sported it with toy spiders hoping for the real fight to happen. Just some crazy little stuff. 2. Even at the dawn of computer games generation, this sport never faded away in the scenes of Filipino culture. The joy of playing spider fighting is priceless, especially when toy spiders are staged for the fight and nothing happens. 3. This sport entails a very critical procedure when catching and caring for the spider. It is going through a process of training like any other sport. But for some to lessen the complications they're staging toy spiders - more fun, less work. Hey yow! You have some cool stuff here! I am kinda into a spidey fight before. Would love to put up your images on my blog if you don't mind? I will link it back and credit to you.